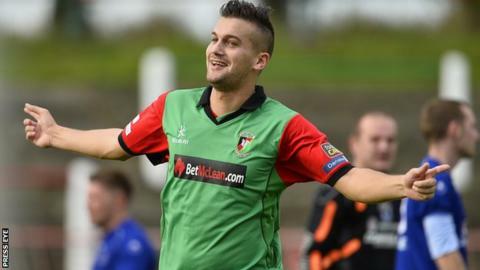 Coleraine have signed Mark Miskimmin from Glentoran as a replacement for striker David McDaid. McDaid left the Showgrounds to join champions Cliftonville earlier this month and former Donegal Celtic forward Miskimmin will fill the void. Miskimmin, 26, joined the Glens from Donegal Celtic last summer on a two-year contract. Coleraine are in need of fresh firepower after scoring just twice in their opening three league games. Oran Kearney's side have yet to taste victory and lie second from bottom with just one point.